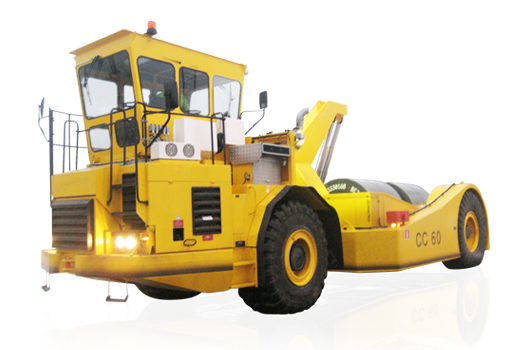 Self-loading and unloading, the Kiruna UV CC60 is designed to lift, transport and stack coils. Coils are stacked horizontally, with eyes to the side. Typical transport: from the hot strip mill to the cold strip mill for processing, or to the storage yard to await shipment. The truck loads two or three coils per round, coils ranging from 20 to 30 tonnes each. Lifting in the hinge principle, with two single-acting hydraulic cylinders. Spherical contact surface to mate with coil’s eye. Soundproofed, suspended dual control operator’s cab installed on rear car for naximum operation control (optional). Gentle handling for minimum damage.